MOORE - Members of the Moore Chamber of Commerce welcomed to the community with a ribbon cutting, Mary Jane Dispensary on January 8th. 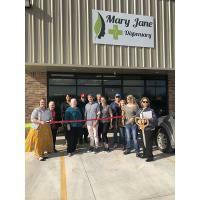 Their dispensary is located at 2990 SE 19th Street, Unit 1 in Moore. Their hours of operation are Monday through Friday from 9:00 am to 7:00 pm and 10:30 am - 7:00 pm on Saturdays.